Farmhouse style ale brewed with Pilsner, Munich, and Wheat malts, with 40 pounds of added fresh rhubarb and a hearty dose of local fresh basil, then fermented with a French Saison yeast for a dry finish. I realize that my review is higher than most but I must say that as far as an advanced beer and the brewers craft I thought that it was killer. When you consider the ingredients and the fact that it was small batch craft I should had given if straight 5s. I considered myself fortunate to have it and hats off Mr. Lawson. This one pours a slightly clouded yellow, with a decent one inch head, and some good lacing. This one smells like, well basil, much moreso than the rhubarb. The actual base saison is not incredibly evocative on the nose. The taste is basically the same. The flavor additions are nice, but the base saison doesn't seem super interesting, and doesn't add much. There's a slight tartness, but not much funk, or really anything significant coming from the yeast- which is kind of the thing saisons do. This is light bodied, crisp and relatively clean. This was definitely interesting to try, but nothing I'd go out of my way to try again. 650ml bottle. Served in a Lawson's snifter glass. Pours a cloudy golden body, massive four to five finger white head that takes way too long to settle down. It's clearly very effervescent, but to be clear, it was not a gusher by any means. So, it took a while waiting to be able to drink a few ounces. Smells of rhubarb, a bit of grass, minerals, yeast, pale malt sweetness. Not so much the basil. It smells mildly tart as well, but not acetic. Flavour is minerals, grass, pale malt, a very light rhubarby tartness that dances on the tongue, with a mild leafy basil finish. I was afraid it would be too strong, but its actually mild and just enough to add a nice twist on the finish. It's solid. Mouthfeel is medium bodied, fluffy, good carbonation without being too prickly, minerals and a bit of basil on the finish. On draft at the Three Penny Taproom in Montpelier. Not bad, but underwhelming. If this was released, say, in sixers and was somewhat accessible, it'd be a great, refreshing go-to saison. As is, it's not worth what it takes to acquire. Pours pale and hazy with medium fizz. Smells like brett and a little bit of savory spice I will attribute to basil. Tastes the same, lightly tart with light modes of pizza. Nice, crisp finish. A neat, delicate little beer that doesn't *quite* come together even though it's still pretty good. Poured from the 22 oz. bomber into a Lawson's stemmed tulip. a: Hazy gold with an inch thick white head which receded to thick even surface foam and dense lacing. s: Overripe light fruit with a slightly sour note. t: Follows the nose up front with a moderate bitterness. Gingery finish and aftertaste is somewhat reminiscent of ginger ale. Light, dry finish. m: Light to moderate, ok body, huge carbonation tingle. o: A highly refreshing and drinkable farmhouse saison, light and fruity in a Belgian or Trappist vein. Despite the stated rhubarb basil content, the French yeast totally dominates the flavor profile, although the rhubarb may have added some light sourness. On the whole I'm not a big fan of farmhouse saisons, but there are some fine ones, and now this is one of them. Poured from the 22 oz bottle into a snifter glass. Pours a hazy deep straw color. Very hazy. One finger of head that quickly dissipates. Aromas are lots of saison yeast, bread, not much basil in the nose. Taste is very saison yeast forward with back of tongue aftertaste of tart rhubarb and distant notes of basil. Really wish the rhubarb and basil was more forward. Having said that , the flavor was very nice. Mouthfeel was my favorite part of this beer. It was perfection, just chewy enough. 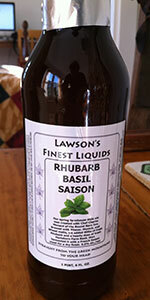 Overall, this beer was delicious, but I would have liked more rhubarb and basil to be present.